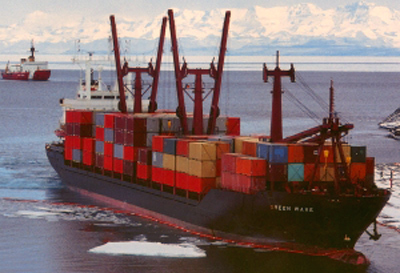 The cargo vessel MV Green Wave arrived at the McMurdo ice pier on 6 February 1998, one of several trips it would make to the ice around the turn of the 21st century. After an uneventful and successful offload, it headed north on the 13th. Two days later, the "uneventful and successful" part of the voyage came to an end. At approximately 0623 on 13 January, the vessel was near Cape Adare, about 400 nautical miles (all distances on this page are nautical miles) north of McMurdo, and 1700 miles from Lyttelton when it experienced engine failure when the #2 piston seized in its liner, and pieces of the liner shot through the crankcase door. The Green Wave had just cleared a 90 mile band of icebergs, although the vessel was drifting at the same speed and direction as the icebergs so there was no immediate danger. The captain (Peter Stalkus) met with the chief engineer Neville Motts, and it was determined that the #2 cylinder would be disassembled and the liner replaced with a spare. Accordingly, Motts, along with the second and third assistant engineers, began this process. The initial step was to remove the 3000 lb #2 cylinder head with a chain hoist mounted on a crane beam installed over the cylinders, and move it to a headstand, which was a special table or jig designed for this purpose, with legs intended to bolt to studs on an adjacent cylinder head. (However, they did not bolt the headstand down.) At approximately 1435, after lowering the removed cylinder head onto the headstand, but before it could be lashed down, the ship took a large roll (which the trial court later determined to have been unforeseeable due to the weather and sea conditions at the time). The cylinder head slid off of the headstand, hitting Motts on his left side, knocking him down and pinning him against an engine rail. After Motts was extricated, the captain and chief mate (the ship's designated medical officer) examined him--he had a 3" laceration on his left thigh but no apparent broken bones. Motts was given first aid and moved to his cabin on a Stokes litter Shortly afterward, George Washington University Hospital, with which the ship's operator had a telemedicine arrangement, was contacted. An immediate X-ray was recommended--something not possible aboard the Green Wave. Still, Motts' condition was not considered life-threatening, and his only treatment other than bed rest was Tylenol with codeine. One of the major issues addressed later at trial was that the Polar Star, which had trained medical personnel--a nurse practitioner and a medical corpsman--as well as X-ray equipment, was never advised as to the potential seriousness of Motts' injury, despite the eventual suspicion of the captain and first mate that Motts had suffered a serious fracture. More on Motts later. Meanwhile, the ship's crew continued with temporary repairs to get the engine operational on 7 cylinders. The ship was under power at 0136 on 17 February, but less than 12 hours later the engine's vulkan coupling ruptured, rendering the vessel dead in the water approximately 500 miles north of McMurdo. At this point, the Green Wave requested assistance from the helicopter-equipped Polar Star, which arrived at the Green Wave's position at approximately 1008 on 18 February. Shortly afterward, the icebreaker took the Green Wave in tow, and the two vessels slowly headed north. 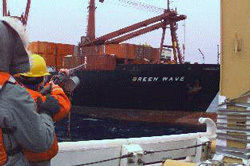 At left, a Polar Star crew member fires a line to the Green Wave in preparation for providing the tow cable; at right, a view from the icebreaker of the Green Wave under tow. The original plan was for the Green Wave to be towed into the northern Southern Ocean and then to be cut adrift to wait for an ocean-going tug to complete the tow into Lyttelton. This was because of the long-time New Zealand ban on allowing port calls by military vessels carrying nuclear weapons, or, more accurately, the resultant American policy against calling at New Zealand ports because the US military would not admit the presence or absence of nuclear weapons. At the time, the nearest available ocean-going tug was in Papua New Guinea, so it would have been a long wait. And conditions on the Green Wave were not good. 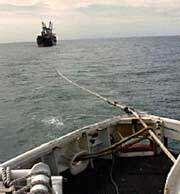 The vessel was operating on a backup generator...water was pumped into 55-gallon drums on each deck for toilet flushing...folks were seasick...and the no-longer-refrigerated freezer containers were thawing, dripping water everywhere. Meanwhile, NSF was working overtime in an effort to get the tow continued at least into the Pacific Ocean, if not into New Zealand waters. Eventually, the nuclear weapons issues were waived by all concerned, due to the fact that the Polar Star was towing a vessel in distress with a seriously injured crewman aboard, and the vessels arrived at Lyttelton on 1 March. Motts was evaluated in Christchurch, and it was determined that he'd suffered a fractured hip and pelvis. His employer LMS gave him the option of having hip replacement surgery in either New Zealand or Houston. He opted for Houston, the surgery was performed on 10 March 1998, but 10 days later he suffered a fatal heart attack. The rest of the story...presumably the Green Wave was repaired. Meanwhile, prior to his death, Neville Motts had brought a lawsuit against his employer LMS as well as the Green Wave owner CGL. The original district court case in Galveston decided to award Danna Motts (Neville's wife) about $1.3 million dollars, but this was reduced by about 50% upon appeal. A few trivial or non-trivial details that came out in court: Obviously a lot of issues involved whether or not this involved admiralty law, which is rather arcane stuff. And there was testimony that the Green Wave's engines had been reported to have major problems, and that the engine manufacturer had recommended replacement of that cylinder liner (among other things) in August 1996. There were other mechanical issues, most significantly a nonfunctioning backflush lubrication system. References and thanks...first of all I must credit JB Freeman who was aboard the Green Wave on this fateful voyage--he initially alerted me to this incident and shared a few of the details. All of the photos on this page are from friend and Christchurch stamp dealer Steven McLachlan. And the referenced court cases (I am not a lawyer)--the original 1999 Federal District Court ruling as well as the subsequent May 2000 ruling by the fifth circuit of the US Court of Appeals. As for this vessel Green Wave, it was first named the Sloman Mira after construction in 1980 in Kiel, Germany, and later in 1984 briefly named the Woermann Mira before being purchased in that year by CGL for service with the MSC, and renamed the Green Wave for service to Antarctica...which it did for 18 seasons between 1994-95 and 2001-02. It was replaced by the American Tern for the 2002-03 season. Interestingly, the Green Wave had to undergo significant repairs in February 1999 after colliding with the outer breakwater at Lyttelton. In 2004 it was sold, renamed the Al Masourah, and finally sold to an Indian shipbreaker in December 2008. (source--cargo vessels-international). The Green Wave that showed up to offload cargo at the hastily constructed pontoon pier in January 2012 was NOT the same vessel...rather it had been reflagged and renamed to commemorate the old ship of the same name.